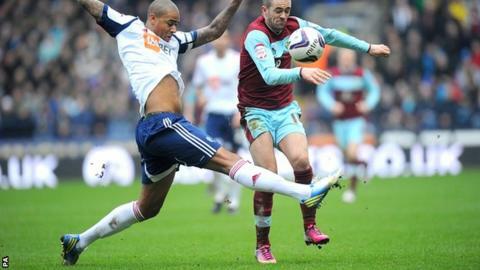 Substitutes Craig Davies and David Ngog were both on target as Bolton came from behind to beat Burnley, with all three goals coming in the second half. After an opening period featuring few clear chances Chris McCann headed across goal for David Edgar to give the Clarets the lead from close range. It prompted the introduction of Davies and Ngog and Davies levelled with a header off the underside of the bar. Ngog turned the ball home for Bolton's first league victory of the year. The Reebok Stadium faithful were initially unhappy with Dougie Freedman's decision to replace Marvin Sordell and lively winger Steve De Ridder. But the new strike pairing helped the Trotters climb to 17th in the Championship table, although they remain only three points above the relegation zone. On-loan West Brom centre-back Craig Dawson should have marked his Bolton debut with a goal in the first half but headed fellow loanee Jay Spearing's corner narrowly wide at the far post. From another corner Dawson forced the only meaningful fine save of the half from Lee Grant, but Burnley went ahead soon after the break when McCann towered above the home defence to nod Ross Wallace's centre across goal to leave Edgar with a simple header. However Lee Chung-Yong found space to cross for Davies to glance home. Marcos Alonso brought a superb save from Grant with a powerful 30-yard free-kick but as the visitors were unable to fully clear from a corner, Spearing drove back towards goal where Ngog stole in front of full-back Danny Lafferty to dent Burnley's play-off push. Bolton manager Dougie Freedman on criticism of his substitutions from the club's fans: "Sometimes you get them right, sometimes you get them wrong - hopefully more right than wrong. "I understand the fans - everybody wants to win, everybody wants to see their favourite player. I completely understand that, I'm a football fan myself. "But I'm a professional guy making professional decisions. Sometimes I take players off because they've got a card or for a tactical reason. "Steve De Ridder hasn't played enough football so I had to take him off early. It's not something I would like to have done but I had to do it." Burnley boss Sean Dyche: "We played some good stuff, we kept the ball and I think the frustration is the fact that after we scored we didn't keep the ball. "That's our strength, using the ball and keeping the ball and we've seen that many times lately. "That was my biggest frustration with the players and I spoke to them about that afterwards, other than the obvious which is the outcome. "At 1-0 I thought the frustration (among Bolton's fans) kicked in here and if we'd dealt with the ball better and kept it better I think that would have only grown."